New Zealand is an island country located in the southwestern Pacific Ocean. 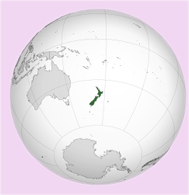 The country geographically comprises two main landmasses ‒ that of the North and South Islands which are separated by the Cook Strait and surrounded by numerous smaller islands. New Zealand is situated some 1,500 kilometres (900 mi) east of Australia across the Tasman Sea. Because of its remoteness, it was one of the last lands to be settled by humans. It is estimated the Maori inhabited New Zealand around 800AD. Around eight hundred years later the Western world discovered New Zealand. New Zealand was first settled by Eastern Polynesians between 1250 and 1300, concluding a long series of voyages through the southern Pacific islands. In 1642, in a bid to locate the mysterious, rich land Australia, the Dutch Explorer, Abel Tasman caught sight of the West Coast of the South Island. New Zealand is made up of two main islands and a number of smaller islands, located near the centre of the water hemisphere. The main North and South Islands are separated by the Cook Strait, 22 kilometres (14 mi) wide at its narrowest point. New Zealand is long (over 1,600 kilometres (990 mi) along its north-north-east axis) and narrow (a maximum width of 400 kilometres (250 mi)). New Zealand has a mild and temperate maritime climate with mean annual temperatures ranging from 10 °C (50 °F) in the south to 16 °C (61 °F) in the north. Historical maxima and minima are 42.4 °C (108.3 °F) in Rangiora, Canterbury and −25.6 °C (−14.08 °F) in Ranfurly, Otago. Of the seven largest cities, Christchurch is the driest, receiving on average only 640 millimetres (25 in) of rain per year and Auckland the wettest, receiving almost twice that amount. New Zealand has a modern, prosperous and developed market economy with an estimated gross domestic product (GDP) at purchasing power parity (PPP) per capita of roughly US$28,250. New Zealand was ranked 5th in the 2011 Human Development Index, 4th in the The Heritage Foundation's 2012 Index of Economic Freedom, and 13th in INSEAD's 2012 Global Innovation Index.